Craig believes in reaching new heights. Almost three decades ago, he had a small two-person helicopter that allowed him to see the world from a new perspective. 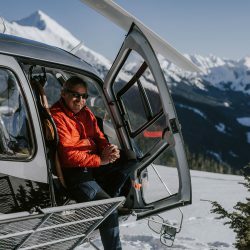 Today, as Librico’s President, Craig is living out his dream of offering a fleet of helicopters that bring people together to experience the thrill of the great outdoors. His passion for the environment and eco-tourism brought him out of retirement and back into the hangar to build Librico alongside John Faulkner in the mountainous Chilliwack region they call home. When Craig isn’t managing Librico’s operations, he takes every chance he can get to soar into the sky and head to Crystal Island on Mount Breakenridge.